While most of the talking points for the regular season opener between the Phoenix Suns and Dallas Mavericks have pitted rookies DeAndre Ayton and Luka Dončić up against each other, and while they’ll certainly get switched on each other at some points throughout the night, the real in-game matchup between Ayton and the Mavericks newly high-priced center, DeAndre Jordan is where the battle will be had. Both DeAndre’s are going to have their hands full in this one. In his first career start, Ayton will be going up against one of the more dominating, prototypical low-post centers in the game in Jordan. Jordan has led the league in rebounding multiple times in his career, to go along with being a two-time First-Team NBA All-Defensive player throughout his first nine years as a Clipper. In his 751st career game, the Mavericks’ DeAndre will be tasked with trying to keep up with the Suns’ more fleet of foot center. Unlike Jordan, who’d rather command the areas nearest to the basket on both ends of the court, the Suns’ DeAndre will surely try to take advantage of his mid-range shooting ability and athleticism against the post master. While on the other hand, the vet would like to use his low post proficiency and physicality when trying to gain the upper hand against the youngin. The first-year Maverick isn’t the same 2-2.5 blocks per game player nor among the league leaders like he once was, as evidenced by his 0.9/gm (tied for career low) last season which ranked 35th, but he’s still certainly capable of making Phoenix’s newest star work for everything he gets during his first taste of NBA action. The elder DeAndre led the league in field goal percentage five straight seasons before finishing second last year to Houston’s Clint Capela, by .007%. The back-to-back rebounding champion in 2013-’14 & ’14-’15 finished last season with a career-high 15.2 REB/GM. Only Detroit’s Andre Drummond (16.0) averaged more in 2017, although based off ESPN’s Hollinger metrics, DeAndre finished leading the NBA in both Defensive & overall Rebounding Rate’s. At 7’1, the #1 overall pick from the University of Arizona will attempt to use his 2-inch height advantage to counterattack Jordan’s 15-pound edge whenever the two find themselves matched up one-on-one. With Jordan’s numbers on the decline for each of the past two seasons in terms of blocked shots, the younger DeAndre should be able to get his numbers on the offensive end as long as he’s able to get the ball in space and isn’t timid about getting physical in his attempts to boxing out the former two-time rebound champ on the offensive boards. The rookie parlayed a nice Summer League into a great preseason. Ayton’s 14.5 PPG, 10.5 REB & 1.0 BLK per game marks while in Vegas for the 4-game NBA Summer League were promising, yet unspectacular to some. To the delight of Suns fans, he bettered those numbers across the board during the 4-game preseason, as he finished averaging 20.5 PPG, 11.3 REB & 2.5 BLK. 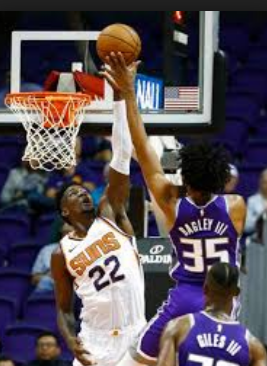 The highlight of each of those games seemingly featured second-year player, Josh Jackson, as the ying to Ayton’s yang. On numerous occasions JJ would feed the big man beautifully orchestrated tear drop lobs near the basket while the seven-footer from the Bahamas would glide through the air to finish in spectacular fashion. While some have likened DeAndre Ayton to a young Shaquille O’Neal, comparing anyone, even one with such a statuesque physic as DeAndre, to a 15X All-Star and Hall-of-Famer is a disservice to the man they called Diesel and to Ayton as well. Not to mention their game, at best, vaguely has a passing resemblance of each others. Sure they’re both 7’1 and were the first pick in their respective drafts, but Shaq’s playing weight of 330 was 80 pounds more than the much slender ex-Wildcat. If anything, O’Neal’s game more closely identifies with DeAndre Jordan’s, at least from the standpoint of their dominance around the basket and to even their similar horrid free throw shooting. Definitely the one edge the first-year player has has over either O’Neal & Jordan that is unmistakable, is a shot, which is supported by his 73% from the line in college and near 80% in the preseason. The other two shot under 55% from the charity stripe for their careers. He’ll be looking to hit shots early on against the Mavericks in hopes of pulling Jordan from out of the middle of the paint, which in turn will open it up for cutters towards the hoop, giving Ayton the ability to find easier baskets for his teammates. Which he is well capable of doing. That being said, it does a disservice to DeAndre for fans to put labels or comparisons on the 7’1, 250-pounder, especially to one of such ilk as Shaq, who was ranked #15 in Sports Illustrated’s Top 50 Greatest NBA Players in NBA History list in 2016. But, if he can avoid major injuries and gain even more weight to help endure the nightly pounding an NBA center takes throughout his career, all the while developing his low post skills on both ends of the floor to the point where it somewhat mirrors ‘Diesel’s’, to go along with his ability to stretch the court with his jumper, and considering the youngsters combination of natural strength and athleticism, his upside is near limitless. Until then, let the kid play and have some fun while getting his feet wet at the highest level in the world. 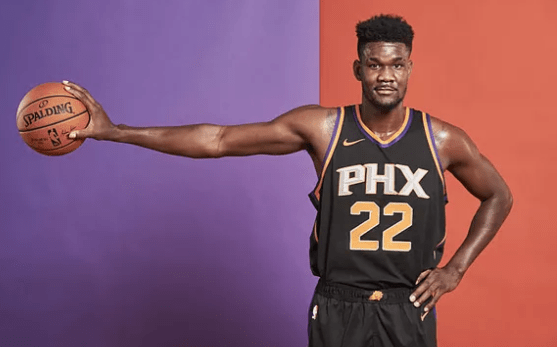 For now, just sit back with a cold one or two with a smile on your face while watching Devin Booker and DeAndre Ayton make music on the court and revel in what the future may hold for you as a Suns fans. Lord knows you deserve it.